A blog about municipal issues in Surrey, B.C. 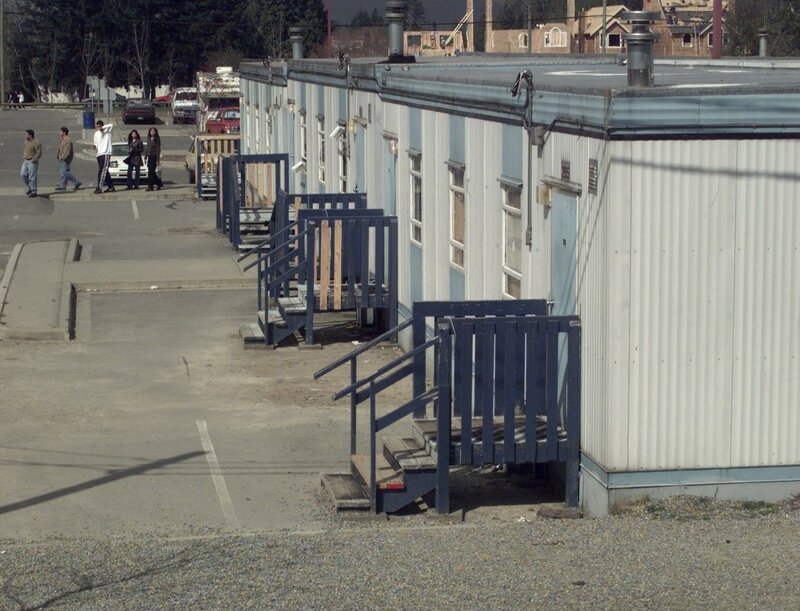 (courtesy PNG) The lineup of portables at Tamanawis Secondary. The Vancouver School Board announced last week they have an $8 million gap in the 2012/13 budget; Surrey’s a district with many similar issues, what about their budget? I checked with the Surrey school district’s communications officer Doug Strachan, he told me that the board’s public input process was complete but that the budget committee had yet to table its findings to the board. That will likely happen in April. Last year, Surrey had a $10 million hole in the proposed 2011-12 budget. The year before that (2010-11), it was $12 million. These past budget crunches were solved by cutting back on library services, classroom supplies and extending the spring break to two weeks. This year was the third year in a row that the school board has had a two-week spring break, and Surrey teachers this week said they weren’t happy about it. This week, the VSB released a report from PricewaterhouseCoopers which suggested a variety of cuts – totalling $16 million annually – that would more than make up the district’s budget problem. 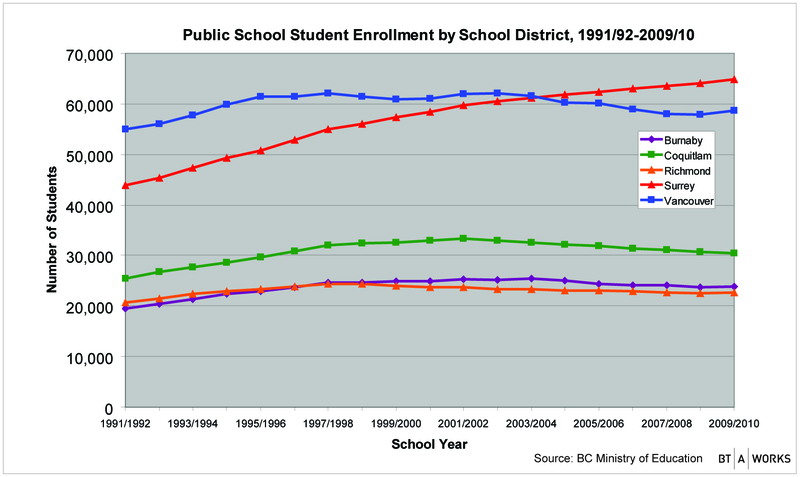 Declining enrolment was, as ever, pointed to as one cause. The report also suggested that funding received from the province was insufficient to keep up with inflation and salary increases. The Vancouver Courier’s Naobih O’Connor chimed in today with some useful numbers for understanding Vancouver’s budget. For instance, each day off for the VSB saves the district about $100,000. With the 10 ‘district closure days’ currently in place – these are not profesisonal development days, literally everything is closed and nobody is at work – the district saves $1 million annually. Also notable? Almost fifty per cent of the respondents to a survey by the board said district closure days were not beneficial. It also noted that the majority of the respondents came from the city’s more affluent west side. So, back to Surrey, the issues are similar. Surrey school district chose to take extra days off for similar reasons. Surrey’s funding model from the province is the same as Vancouver’s. Surrey’s infrastructure costs are almost the complete opposite of Vancouver’s – overcrowded, newish infrastructure, compared with older, oftentimes underutilized infrastructure. And of course, inflation in Surrey is the same as in Vancouver. Seems we can expect dour news whenever it is that Surrey releases its budget. We fear density, but at what cost?